The subdeacon is the person who assists the deacon and priest in the divine services. 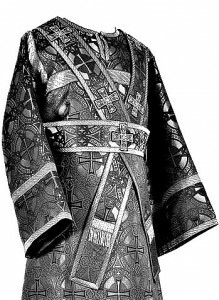 He is distinguished by his orar, which is a cloth looped around both shoulders, forming a cross both in front and in back. This cross is referred to as the “angelic fashion” as it is reminiscent of the six wings of the seraphim (cf. Isaiah 6:2). The subdeacon’s liturgical role is primarily that of servant to the bishop. He assists the bishop during hierarchical services by vesting him, by looking after and presenting the trikeri and dikeri (the triple and double candles of the bishop), etc. Outside of hierarchical services, the subdeacon serves in the altar as any other server but, as highest-ranking of the minor clergy, is responsible for training and leading the serving team. The subdeacon also has practical responsibilities in the care of the altar by cleaning it, looking after the clergy vestments and the cloths of the Holy Table, cleaning and mending them, and changing them according to the feasts, fasts, and seasons. For this reason, he has a general blessing to touch the Holy Table and the table of oblation, which readers and other servers may not do. Should the need arise, the subdeacon may serve in the absence of a reader in the reader’s role.